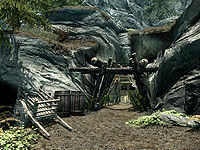 Embershard Mine is a small iron mine between Helgen and Riverwood. The mine has an exterior and one interior zone: Embershard Mine. There is a slightly hidden path that leads from the banks of the White River to Embershard Mine. It's recognizable by the wooden slats that lead up towards it. As you approach the mine itself, a bandit will warn you to stay away, and rush to attack you if you linger or continue to approach. There's a wheelbarrow, a wood chopping block, and woodcutter's axe by the barrels, just outside of the entrance. There is also a beehive above and to the right of the entrance. The mine itself is fairly well lit, but a light source will definitely come in handy. There are lots of fly amanita to harvest throughout the mine. As you descend down into the mine, there is a falling rock trap that can do a fair amount of damage if you are low-level. If you sneak in, you'll hear two bandits mentioning the guard outside and the trap. There is a pickaxe next to their cooking fire in case you need one to start harvesting iron ore. Further down is an intersection that will lead you to a collapsed tunnel section and a tattered journal. Going to the left will lead to a small drinking area and a lever which will lower the bridge. If the two bandits have been killed, this alerts two more bandits who will charge at you immediately. If you manage to remain hidden from them, they will split up and become easy targets to kill. After crossing the newly opened bridge, there will be a dark tunnel. There is a coin purse above you near the base of the bridge. It can be snagged manually with a little careful maneuvering, shot down, or, with some luck, you can activate the lever to raise the bridge, and then attempt to cross it as it raises—it will propel you upwards and place you atop the entrance to the dark tunnel. Moving forward, as you pass a small window to another area on your right, another bandit will come at you that has the Embershard Mine key on him. The nearby prison cell is empty, but where the bandit came running from contains a chest containing leveled loot, several sacks, and a Spell Tome: Clairvoyance. 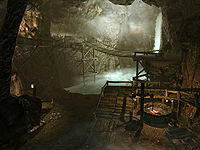 Further into the mine, the main living area of the bandits is found. Three more bandits will attack, including an archer. The room has three levels, a cooking fire, and lots of good loot to be found. The bottom floor contains a crafting area, several iron ingots, and a copy of the Smithing skill book Light Armor Forging. The mid-level contains a kitchen and pantry section with lots of food items, a chest, and several gems. A path behind the kitchen leads to yet another chest nestled next to the waterfall. The top path will lead out to another pathway filled with bone rattle alarms and the exit back outside just southwest of Riverwood. Three hanging moss plants. One of these can be harvested by jumping from the rails along the path to the "rear" entrance. To the right of the "front" entrance, outside, is a beehive hanging on the underside of a ledge. Next to the first campfire after you first descend into the mine. First intersection between the collapsed tunnel and bridge lever room. Bottom of the tunnel just after the bridge next to a wood pile. Just past jail cell behind boards that look like they are holding the wall up. Hallway just past the jail cell next to a wood pile. Bottom level of the large room between the water and the forge, under the walkway. Middle level of the large room next to the waterfall. Take the path behind the kitchen. Right outside the doorway to the left. Path from the top level of the large room next to a bone rattle alarm, just before the Riverwood exit. In addition to the 8 veins inside the mine there are two more outside the back exit from the mine, about ten paces ahead and slightly to your left. One stone quarryHF can be found to the left of the entrance, just beside the wooden cart. Entering from the unmarked exit may result in the two bandits behind (now in front) of the bridge you need to manually lower not spawning. It appears the trigger for them to spawn is lowering the bridge from the entrance side. If the two bandits in the first chamber are alive (or reanimated) when the bridge is lowered, the two bandits that usually spawn and run across it will not spawn. This page was last modified on 24 November 2017, at 18:45.